Born on May 18, 1976, Todd was a beautiful baby and the baby of our family. Other than his years at college, he lived with his family in River Edge, New Jersey. Todd was on the threshold of moving out when his life was cut short on September 11th, 2001. Todd's early years involved endless playing on our dead-end street and attending the Paramus Cooperative Nursery School. While in the fourth grade at Roosevelt School, Todd began getting panic attacks and, after a short while, was unable to attend school as a regular student. For the next three years, the focus of our family was on helping Todd to resume a normal, happy life. We were fortunate to find a skilled and compassionate child psychiatrist to guide Todd through his difficult journey. The second half of Todd's life was rich and full. He became an honors student at River Dell High School, where he played football and wrestled. He had many good friends who, to this day, consider themselves Todd's other family, and Beemersa local sports pubwas his other home. Working summers as a camp lifeguard, Todd developed a joyful love of children. He flourished at the University of Michigan, spent an inspiring semester in Florence, Italy, and graduated (on the four-and-a-half-year plan) with a degree in psychology. Upon graduation, Todd joined the firm of Cantor Fitzgerald. Having always had a good head for numbers (weaned on baseball statistics), he enjoyed the work and cherished the camaraderie of his colleagues. Todd loved nothing more than being out on a golf course and was a devoted Yankees/Jets/Devils fan, attending as many games as is humanly possible. He was the proud new owner of his first car. Todd had a brilliant smile, a carefree laugh, and a subtle, witty sense of humor. We have been receiving glimpses of Todd from many who knew him well through the years. Todd at 25 emerges as a sensitive and caring friend as well as a content person living his life with zest. 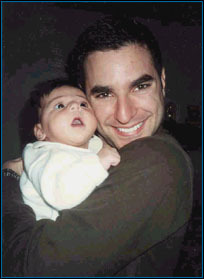 His role as godfather to his sister Amy's baby daughter, Ashley, developed a new dimension of Todd. He will not know his brother Jordan's sons, Christopher Todd and Nicholas Raymond, or Amy's sons, Andrew Todd and Aidan Todd; but Ashley, Christopher, Andrew, Nicholas and Aidan will grow up knowing about their Uncle Todd. "Many people have life-changing experiences every day, and they don't even know it. My life-changing experience lasted two and a half years, and I remember it vividly. Am I lucky? Maybe. I suffered for two and a half years, but in those two and a half years I learned more than most people learn in a lifetime. I realized that the time a person wants to give up is the time when it is imperative for that person to fight the hardest. I learned that with family a person can overcome anything. And I discovered no matter how big the person is on the outside (for I am only 5' 5'' tall) that the size of the heart is always going to be more important." How we loved the Todd we knew and miss knowing the man Todd was maturing into.